By stoat on November 7, 2014. Between Migdol and the Sea is the book, by Carl Drews, of the paper Dynamics of Wind Setdown at Suez and the Eastern Nile Delta, by Carl Drews and Weiqing Han. Just so you don't get confused, its subtitled "Crossing the Red Sea with Faith and Science". Those with long memories will recall the Great Fuss and Part II four years ago when the paper was first published. Since I was nice then, Carl asked if I'd like a copy of the book, and I said yes. Having read the book, and re-read what I wrote then, and a number of comments by other people, I don't find anything I'd want to unsay; and about the science, nothing more I need say. I feel a bit guilty for calling it a harmless minor piece of hydrodynamics (Carl asks if he could perhaps be promoted to "mostly harmless"). How one approaches a subject affects the language one uses: I came to this from the PZM side, not agreeing with him, but trying to find some compromise with him (which didn't work, but never mind). So my language towards Carl wasn't so conciliatory. We get one minor extra data point from a four year's perspective, which is who has chosen to cite it. The answer (if we ignore one from ICR) is a couple of times, but only as an example of the sort of simulations ROMS can do. So, not great, and clearly it hasn't started a new field. But almost nothing does, so that's hardly a complaint. The best defence of the paper remains what it was before: academic freedom, the value of curiosity-driven research, and playfulness. The paper is the center of the book, but there's rather more. 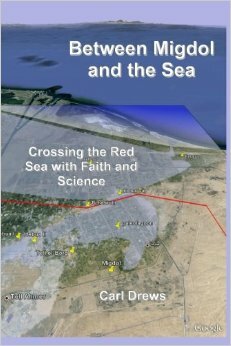 Perhaps the core is in the subtitle "Crossing the Red Sea with Faith and Science"; that's what he really wants to establish. And before we re-open all the old arguments: no, this still doesn't affect the value of the paper, considered in isolation. To convince you of his thesis, he needs to do a couple of things: 1, that it could have physically happened; 2, that it kinda fits, in terms of the mechanisms of getting people across; 3, that it works historically. There's also an interesting survey of other people's proposed places where the crossing might have occurred, and such. Other attempts to date the Exodus to a specific century have been equally inconclusive. Details in the story in fact hint that a complex and multilayered editing process has been at work: the Exodus cities of Pithom and Rameses, for example, were not inhabited during most of the New Kingdom period, and the forty years of wilderness wanderings are also full of inconsistencies and anachronisms. It is therefore best to treat the Exodus story not as the record of a single historical event but as a "powerful collective memory of the Egyptian occupation of Canaan and the enslavement of its population" during the 13th and 12th centuries (Ann Killebrew (2005), p. 151). Doubtless you have your own opinion. Carl has several chapters addressing this and trying to demonstrate the historical reality of the Exodus. This is interesting, to me, because had you asked me I'd have said "well the Bible says that God parted the waters". Or somesuch. But it says no such thing: it says fairly clearly that God caused a wind, and the wind moved the sea. Who cares about such distinctions? Well, I do: because its interesting when a piece of text you thought you knew turns out not to say quite what you thought it did, when you read it closely. The second interest is not one for me, since I'm a good atheist: the distinction between miracles that are clear suspensions of the laws of physics, and miracles that are merely massively improbable; that are essentially only miracles because of the coincidence of timing. Carl wishes to establish the crossing of the Red (really Reed) Sea as one of the latter type. To me, its a weird distinction: if I were an all-powerful God, why would I ever bother with the second sort? Causing a wind to occur at just the right time would be "as hard" as just pushing the water aside directly (I put "as hard" in quotes because it doesn't mean anything, physically; both are suspensions of the laws of physics, only one of them is indirect). But I'm an atheist, not an all-powerful god. There's also some examination of words. Does "the waters were a wall unto them on their right hand, and on their left" mean as with Charlton Heston, with a physical "wall of water"? Or does it mean "wall" in the sense of protective barrier? Depending on how you view things, this is either an interesting exercise in trying to understand the language, now, as written thousands of years ago; or weaselling. I'm happy to go with the former. I feel I ought to have one, but I haven't. Oh, but what about conclusion of the article Jerry A. Coyne aka Why Evolution Is True wrote? He really really didn't like the paper, in much the same way as PZM. JAC boldly predicted But I predict that... will open the floodgates for a whole host of Jebus-scientists to publish “technically sound” defenses of the Bible. So, he was wrong. Ha. Snappy enough? * Could Wind Have Parted the Red Sea? Inventing excuses for a Bible story, and getting them published in a science journal? "wall" --- One might actually look at the oldest extant copy of Exodus, probably a Greek language copy from Alexandria. What was the term used there? David, the Septuaginta has "τεῖχος" in Exodus 14:22, 29. AFAIK, it's the word used for the wall around a fortified place or a town. If nobody blinks when a Northeaster piles up enoungh water to cause coastal erosion, why get excited about a simoon causing tideline recession ? There is a 97% consensus that a sea existed at some arbitrary point in time. There is a 97% consensus that 666E666 homo sapiens crossed said sea in 666E-666 units of Phuck time (Phuck time = 666E-666 Planck time). There is a 97% consensus that many, Many, MANY multiples of hearsay would not be admissible as evidence in modern courts of law. In my new book titled "Christian Myths, Legends and Known Contemporaneous Facts" the facts section was the easiest to write, all of one page titled "Contemporaneous Facts" and absolutely no text follows except for the two word sentence "The End?" Not remembering the original kerfuffle I went & had a look at your links, I was curious enough to click on your links to the discussion at PZM's - to no avail, all comments gone! "Civilization" being the Late Bronze Age. Author makes the point that we know a lot more about a lot of other events of the period - events that seem related to the legendary Trojan War are mentioned in archives of the Hittite Empire. But nothing that suggests the Exodus. The Philistines may be "Sea Peoples" (mentioned by the Egyptians) who invaded Asia Minor, but a corresponding movement of Jews into "Canaan" is not clearly evident. in the historical or archaeological record. I reccommend the book as a good survey of what is known about this period in history - the amount of written records (preserved in baked tablets) is surprising, if too sparse to be conclusive. Thanks for the article! I had friends read my book draft, and I hired a free-lance editor to review the text; but it's instructive to see "Migdol" through another person's perspective. I'm with you on this one (and so was Josephus). If I were an omnipotent god equipped with quick-drying concrete, it would be a simple matter to create two walls on either side of the passage and pump out the water in the middle. Then when the Israelites had passed through, I would yank out the supports and inundate that dastardly Pharaoh and all his chariots. Why bother with that east wind anyway? But the Bible does not describe the crossing that way. If God had to push aside the sea, He would be fighting with the sea. Of course He would win because He's Almighty God, but He would still be fighting the forces of nature. In Hebrew and Christian theology, God has no need to fight the natural world because He made it and He is in charge of the sea and the wind. Do I fight with my snowboard? Do I fight with my well-maintained bicycle? Of course not! For Bronze Age people living before the age of science, there were many gods and demons and spirits associated with the mysterious natural world. The narration of the Ten Plagues makes it clear that God commands the natural environment of Egypt. The story of the crossing in Exodus 14 continues that religious theme. No matter what you and I may think of God's method for delivering Moses, this idea of not fighting but commanding is consistent through the New Testament as well. If you and I were with our disciples on the Sea of Galilee in a storm, we would probably issue life jackets and make the gunwhales of the boat higher, or conjure up an outboard motor and whiz back to shore. But Jesus commands the wind and waves to be still (Mark 4:35-41). For a modern parallel, how about not building seawalls along every coast, but using less gasoline instead? [Firstly, hello. I'm glad you've showed up, and I feel slightly guilty for not telling you I'd done this post. I did keep meaning to. I still chuckle over that citation from the Institute for Creation Research. Does that count? I believe your phrase "prompted to mostly harmless" (above) should be: "*promoted* to mostly harmless". Per Israel Finkelstein & Neil Asher Silberman in The Bible Unearthed: Archaeology's New Vision of Ancient Israel and the Origin of Its Sacred Texts, there is no archeological evidence of either Exodus or a substantial Hebrew presence in Egypt - but much evidence to suggest the whole story was made up in the time of King Josiah (who went through a big performance about finding "true" sacred writ in the back of the Temple). I have e-mailed the archived comments for you to handle as you see fit. You received 93 comments on your blog "Strange stuff from Pharyngula" dated September 23, 2014. The comments tapered off on October 8, but there was one Johnny-Come-Lately named Carl Drews on January 13, 2011 who posted about the God-of-the-Gaps fallacy. Enjoy the walk down memory lane! I am quite familiar with Finkelstein & Silberman "The Bible Unearthed" (2001). In fact, "Between Migdol and the Sea" contains a detailed rebuttal to their book in my Chapter 9, pages 215-234. I have their book in front of me now. >>It is impossible to say whether or not the biblical narrative was an expansion and elaboration of vague memories of the immigration of Canaanites to Egypt and their expulsion from the delta in the second millennium BCE. >>The saga of Israel's Exodus from Egypt is neither historical truth nor literary fiction. It is a powerful expression of memory and hope born in a world in the midst of change. The confrontation between Moses and pharaoh mirrored the momentous confrontation between the young King Josiah and the newly crowned Pharaoh Necho. In short, F&S explicitly deny that the Exodus is "literary fiction." They do not say that the whole story was made up. With regard to the Hebrew presence in Egypt, on pages 52-54 "The Lure of Egypt" Finkelstein & Silberman describe an abundance of archaeological finds and historical texts attesting to the presence of Semitic people traveling between Canaan and Egypt. These people came to Egypt because of famine in Canaan, and some of them were conscripted as forced laborers. At least two of these Semites ran away and escaped, according to Papyrus Anastasi V (Migdol p. 157, 253). The Josiah Hypothesis hinges on the role of Judah in the Pentateuch. Would Mr. Butler let us know if he agrees with the statement by F&S on pages 44 and 46: "the Genesis stories revolve (mainly) around Judah."? As described in Migdol Chapter 2, I believe the Bronze Age Israelites who actually made the sea crossing would have testified that the Divine intervention was obvious and undeniable. They were sure they were going to die, and they ended up safe. Praise God! But Exodus 15:22-25 notes that just three days later, the Israelites were grumbling. Perhaps there is some sympathy here for William Connolley's objection. Why didn't God make His presence more obvious? Why did that confidence in God's deliverance last only three days? We have gone around this question several times on Panda's Thumb. The answer is that in standard orthodox Christian theology, it takes faith. Jesus is willing to provide more evidence to the doubting Thomas in John 20-24-29, but some measure of faith will always be necessary for belief in God. That measure differs from person to person. Some kind of faith connection is necessary. The requirement of faith is simply a Mystery of Christianity. I read The Bible Unearthed many years ago, and don't have time to re-read it now to give Carl Drews @ # 10 a comprehensive reply. It is impossible to say whether or not the biblical narrative was an expansion and elaboration of vague memories of the immigration of Canaanites to Egypt and their expulsion from the delta in the second millennium BCE. So, yeah, it's easy to conclude the "whole story" is propaganda made to suit Josiah's purposes. Your conflation of "Semitic people traveling between Canaan and Egypt" and the tiny subset of those called Hebrews does not inspire any confidence in your version (hell, Babylon was Semitic); your acknowledgement of "faith" as a necessity for your perspective destroys benefit-of-the-doubt for your case. We can see massive lies becoming accepted as "reality" around us daily; books such as TBE and Richard Elliott Friedman's Who Wrote the Bible? show very clearly this process has gone on for at least 28 centuries. So - Mr. Butler and I agree that The Bible Unearthed does not claim of Exodus that the whole story was made up. Between Migdol and the Sea addresses the "except for the Egyptian forts..." argument by Finkelstein & Silberman on my page 218. One thing is certain. The basic situation described in the Exodus saga - the phenomenon of immigrants coming down to Egypt from Canaan and settling in the eastern border regions of the delta - is abundantly verified in the archaeological finds and historical texts. Later in that same chapter, their Figure 6 map of the Nile delta on p. 58 puts Migdol right where I locate it. More convergence. I will stick with my original statement on faith: Faith may be needed to accept historical narratives of Divine intervention when there is a substantial natural component. Mr. Butler did not answer my question about Judah and Genesis. Caught between the rock of archaeological evidence and the hard place of Israeli politics, Finkelstein & Silberman do indeed hedge their language carefully. My quickie re-reading of the "Exodus" chapter I cite in # 12 boils down to: many non-Hebrew Canaanites lived in Judah at the time the Deuteronomical documents (including much more than the book of D itself) were written, and it was those Canaanites' tribal experience in lower Egypt that was co-opted by the Temple priests to (a) expand the Hebrews' limited set of stories and (b) aid in politically unifying the disparate cultures burgeoning around the Jerusalem area after the Assyrians withdrew. As for "Genesis", I would have to review analyses of the D, E, J, & P contributions to that mashup with an eye towards the Judah/Israel relationship before offering any opinions - more than I want to do tonight and probably much more off-topic than a long-suffering climate blogger has any reason to accommodate.